Elinor Glyn was born Elinor Sutherland in Jersey but on the death if her father the family moved to Canada to live with her aristocratic French Grandmother. She returned to Jersey after her mother remarried and grew up to be very beautiful but unmanageable with a vivid imagination. At 28 she married a rich landowner Clayton Glyn and honeymooned in Brighton where her husband hired Brill’s Baths in Pool Valley so that he could watch her swim naked in private ! 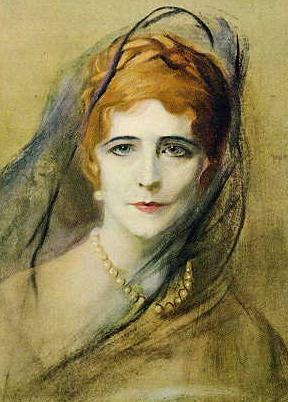 She began to write fiction for pleasure and in 1900 published her first novel “The Visits of Elizabeth.” This was followed by “Three Weeks” in 1907; it was considered scandalous but sold extremely well and did much to ensure Elinor’s wild and racy reputation. Later when her husband lost much of his wealth she took up her pen professionally; and succeeding novels were also sensational, often with an aristocratic background, and they too they were instant successes in the field of popular fiction. In 1920 she went to Hollywood to become a screenwriter; she wrote the screenplay for “Three Weeks” and invented the famous “It !” of the the Clara Bow film of the same name ! She returned to Brighton frequently and lived for many years at 17a Curzon House, Saltdean. Elinor Glyn is played by Joanna Lumley in the film “The Cat’s Meow”……..and had a sister who married Sir Cosmo Duff Gordon who as Lady Duff Gordon became a well known socialite who survived the sinking of the Titanic !